Unicorn-themed desserts have quite easily become one of 2017’s most popular trends! From the iconic Starbucks® Frappuccino® drink, to cupcakes, cakes, and more: these magical treats surely aren’t going anywhere (yet)! This delightful new recipe is bringing a classic and amusing twist on traditional cookies. Are you ready for it? Prepare yourselves, it’s quite the doozy—or dare I say, poopy. That’s right: this summer, jump in on the trend by baking these Colourful Unicorn Poop Cookies! They’re bound to be the only magical poop cookies you’ve ever baked that can taste as sweet as a rainbow! Plus, a treat as adorable as this one will surely please the kiddos as well (and friends and family)! 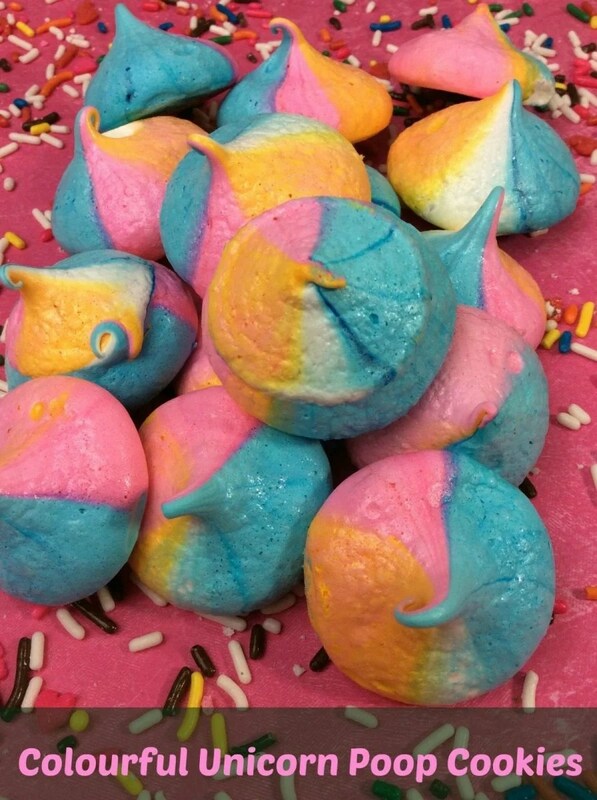 Colourful Unicorn Poops have truly never looked more deliciously appealing! In a standing mixer, add in the egg whites and cream of tartar. I hope you enjoyed the Unicorn Poop Cookies Recipe. If you make it, make sure to share with us on Facebook or Twitter! Also, check out all of our other Recipes. I can totally hear my kiddo laughing already with that recipe name! This looks like a fun recipe my daughter would really enjoy making! LOL I love these, I will have to make some unicorn poop for my grandkids!! Good question? I don’t know….I don’t have this issue. Maybe we should Google this as I am curious. I don’t know if my kids have ever tried meringue cookies. These would be a great way to introduce them :). I personally don’t understand this unicorn everything craze (I lived through the original one in the 80’s as a child), but I know my niece will love this! This is definitely a fun recipe – to make and eat! Okay – these are adorable – I just think I’d get all the colours to bleed together or something though. These look really good and the kids would love them. They made me think of the chocolate macaroon candies you can buy. Thanks for sharing. These look so fun! Thank you. These would be a lot of fun to try, they’d be great for perking up the kids during the cold days of winter we’ve been having lately. The kids will certainly get a kick out of the name !